A US diplomat is asked to help negotiate the release of an American hostage in Beirut. Beirut is directed by Brad Anderson and was released on Apr 11th, 2018. 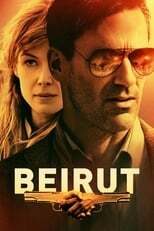 Director Brad Anderson's Action & Thriller movie Beirut is produced by Radar Pictures & ShivHans Pictures & was released 2018-04-11.